A new initiative by Not for Profit magazine, The Big Issue, to address women's homelessness issues in Australia has been launched by the Prime Minister's wife. The Prime Minister’s wife, Therese Rein, has joined an impressive list of Sydney business women to introduce a new initiative that hopes to address the needs of Australia’s 46,000 homeless women. 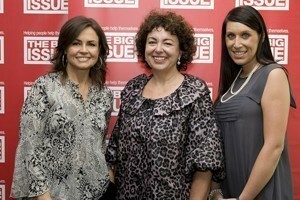 Hosted by the Macquarie Group Foundation, on behalf of The Big Issue Magazine, Therese Rein launched The Big Issue’s Women’s Subscriptions Enterprise. The initiative will address the issues faced by homeless and disadvantaged women in the community, by the establishment of a subscriptions model for selling The Big Issue magazine around Australia. Head of Corporate Affairs for The Big Issue, Natalie Susman, says every night more than 46,000 Australian women are homeless, making up 40 percent of those sleeping rough or in improvised shelters. Susman says the largest single cause of homelessness in Australia is domestic and family violence, which overwhelmingly affects women and children. She says The Big Issue has recognised the need to establish a viable and sustainable social enterprise that can provide appropriate employment, training and pathway opportunities for disadvantaged women, giving them financial independence and ultimately allowing them to change their lives and have control over their futures. After an initial start-up period, the Women’s Subscriptions Enterprise is expected to become entirely self-sustaining through revenue from ongoing subscription sales. Wife of the Prime Minister, Therese Rein, expressed her support for the initiative saying the program aims to provide homeless women with a non-judgemental, safe and flexible work environment that can improve their financial circumstances while encouraging personal development, independence and hope for a stable future. The Big Issue has been operating in Australia since 1996, with vendors selling more than 5.5 million magazines and generating $9.5 million, which has gone into the pockets of homeless and unemployed people. However, the majority of street vendors are male – many homeless and disadvantaged women have far greater and more complex range of needs, including safety and security (often caused by a history of abuse), mental and physical health (sexual and pregnancy related), disability, drug and alcohol dependency and childcare. As such, they face limited opportunities to enter the workforce in a secure and appropriate way. The introduction of the Women’s Subscriptions Enterprise is the outcome of an extensive Feasibility Study funded by the Minister for Housing and Minister for the Status of Women, Tanya Plibersek. The study had a number of key, inter-related aims, including reviewing what work opportunities best meet needs of homeless and disadvantaged women and potential markets for a subscriptions service for The Big Issue Magazine. The outcome of this extensive study showed that a subscription service to The Big Issue Magazine represents a robust and attractive business proposition and could be designed to provide work opportunities to homeless women by involving them in the dispatch of the magazine. The approach would meet the needs of disadvantaged women and could be delivered within their skill sets. The Women’s Subscriptions Enterprise Business Model: Subscriptions will be sold through professional telemarketing services and disadvantaged women will be employed to work as Dispatch Assistants and collate, sort and insert the magazines every fortnight. The Women’s Subscriptions Enterprise is entirely scalable – as Subscriptions are sold, revenue is directed straight into the pockets of disadvantaged women, through provision of wages, training, mentoring and support. It is financially sustainable and totally viable after the start up phase of the program. I am a women who has everything but in the last couple of weeks it has really annoyed me that Therese can have a fundraiser for women’s homelessness for Australians but her husband can pay $1.3 million for Accommodation in Virginia Palms (Brisbane) for refugees that illegally come to Australian. We have so many Australian families that are living in boxes, under bridges, abandon homes and live in their cars. It makes my friends and I extremely angry that our leader and his wife want to help Australian Homeless Women but can put money towards people that illegally come to our country. I did have concerns for those families but after seeing it myself at Virgina Palms and seeing how great of a life the illegal families and then going into the city and seeing first hand Australian families living on the street just makes me sick. STOP helping other countries and HELP our own. You both use to live in Brisbane come and see what our Government has done to Australian families. And before everyone jumps down my throat, I have opened my home by applying to become a foster carer because I have the room and money to help.